MP Mu Sochua holds up copies of Who Killed Chea Vichea? Today marks the the passage of eight years since the murder of Chea Vichea, as well as eight years of failure by the Cambodian government to investigate the crime. Two men featured in the film Who Killed Chea Vichea? served nearly five of those years in prison, and are now on provisional release, in theory waiting for a re-trial that could clear the way for an investigation. This year the Free Trade Union (now led by Vichea's brother, Mony) decided to cancel their annual march to the site of the assassination, saying it would conflict with laws related to the ongoing Senate election. Instead, according to the Phnom Penh Post, about 100 people attended a memorial ceremony at nearby Langka temple. 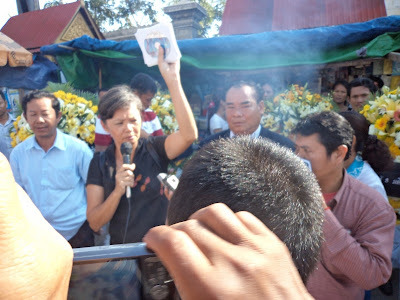 Opposition member of parliament Mu Sochua held out copies of Who Killed Chea Vichea? as evidence to justify an investigation into the case and said that she "handed a copy to an agent of the Ministry of Interior who was in the crowd asking him to take it to his bosses." However, according to the Post, an Interior Ministry spokesman said the ministry cannot re-open the investigation into the murder since the two men are still officially guilty. The spokesman did not explain, at least in the article, why a person would have to be brave to make such an accusation. Cambodia's prime minister, Hun Sen, has signed off on a request from the Free Trade Workers to permit the placement of a statue in Phnom Penh to honor Chea Vichea. It seems previous requests had not been directed to the appropriate recipient. The governor of Phnom Penh was cited in the Post saying that had Chea Mony petitioned Hun Sen directly, the request "would have been granted a long time ago." I am very happy that the Free Trade Union of Workers in the Kingdom of Cambodia (FTUWKC) succeeded in its demand to the royal government to provide a location for the building of a statue for Chea Vichea, my husband. However, I and my two children, as well as the public – in particular all the workers – believe that Chea’s Vichea’s soul has not found peace yet, and he cannot leave this world yet because justice was not provided to him since the government could not find the killers. Therefore, I and my two children are asking the government to find justice for our beloved husband and father. Ron Abney, a kindly fighter for freedom, passed away as this new year began. Ron spent many years side by side with the Cambodian democracy movement as an adviser and ally. He was wounded in the 1997 grenade attack against peaceful demonstrators in Phnom Penh, and never stopped demanding justice for those who died there. He founded Voices for Global Change and became a pillar of the Takeo Orphanage in Cambodia. And in the last three years, he served on the advisory board for Who Killed Chea Vichea?. 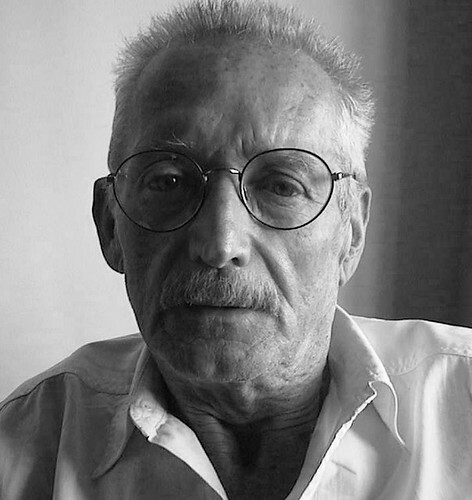 Ron was a man who would chip away at the wall of injustice even if it were a thousand miles high. If all of us did the same, it would fall in an instant.